Where do your students get their news? What do they know about bias and credibility of sources? Is it important that they understand these concepts? Do THEY know that it is important for them to understand these concepts? In a world where last week a front-page BBC article is titled “Facebook, fake news and the meaning of truth,” we need to seriously consider these questions—and not just hope that some past or future teacher has covered or will cover it, since no teacher ever taught US, so we’re not really sure how to go about teaching anyone else. Here’s what happened to me and in my class in the last two weeks—at first surprising and a little frightening as a work check-point turned into formative assessment, then a little nerve-wracking as I tried something new, and finally very exciting as students took ownership of the necessity of understanding bias and credibility in news and other online sources. I gave 10th graders a Google Classroom assignment to hold them accountable for their research during the period before Thanksgiving break since I was missing class for an educators’ conference. The assignment was basically a 2-item annotated bibliography on the research question they had each brainstormed the day before. They were to find 2 sources and for each one, record the publication information in MLA Works-Cited page format and write one sentence explaining why it is a credible source and one explaining why it is relevant to their question. Because it has contact information. Because it’s dedicated to my topic. Because it’s a news source. Each sentence is one piece of an over-all picture of credibility, but none are stand-alone assurances. Why is this website credible? Students spent 5 minutes freaking out over the amazing Pacific Northwest tree octopus. One student asked to go to the bathroom and then forgot about it (that’s real engagement!). Another student said, “This almost sounds like a hoax web site, but I know it’s not.” Then they finally began catching on. Sasquatch? Hey, wait a minute. Where do you get your news? Can you list the names of newspapers, periodicals, web sites? What are their bias? We briefly discussed left/center/right, liberal/conservative. 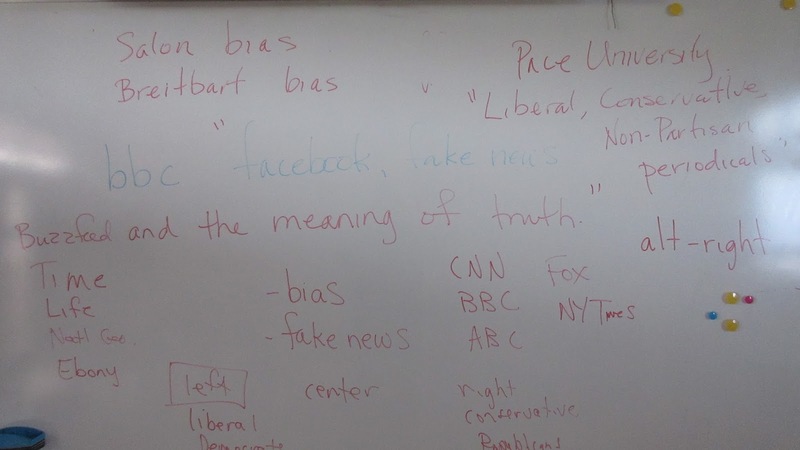 One of the students had actually used Breitbart and Slate as the 2 sources—I pointed out what a fascinating comparison could be made if one were aware that the 2 sources had diametrically opposed political biases! And we used this web page to classify a few of the sources we’d listed. Home learning: Read and take notes on this list of ways to determine online source credibility (anything you didn’t already know about credibility of sources--well enough to use on the tree octopus site!). Day 2 we started out with a discussion of what they’d learned in last night’s reading. Then I projected a white supremacist web site. We discussed what factors reduced its credibility even though it had some of the factors they’d cited at first as credible: contact information, links, dedicated to one topic. “Can we use that list we read last night?” Music to a teacher’s ears! Oh, the discussions that ensued! 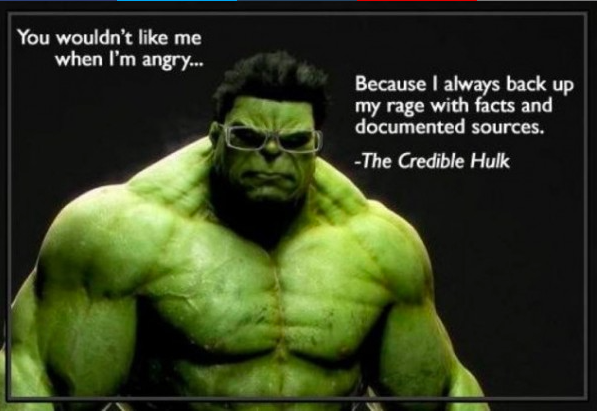 Discussions about primary and secondary sources, about grammar and capitalization, about corroborating information googled, about whether having a stated bias made a source not credible or was just something to be aware of…. Yup, that was an exciting week. Which brings me back to where I started: Where do your students get their news? What do they know about bias and credibility of sources? Is it important that they understand these concepts? Do THEY know that it is important for them to understand these concepts? Because gullible teens with education in discerning source credibility may turn into a more savvy adult population. It’s in our court now.